The pomegranate comes originally from Persia (Iran) but they are nowadays grown in large areas around the Mediterranean, in the Middle East, Afghanistan and India. The fruit symbolizes fertility thanks to their seeds, but also the death due to its clear red inside. The apple is often mentioned in the history books. Did you for example know that Tutankhamun (a little bit of history can never do any harm right?) was buried together with a whole bunch of pomegranates to make sure that his rebirth would be successful?! 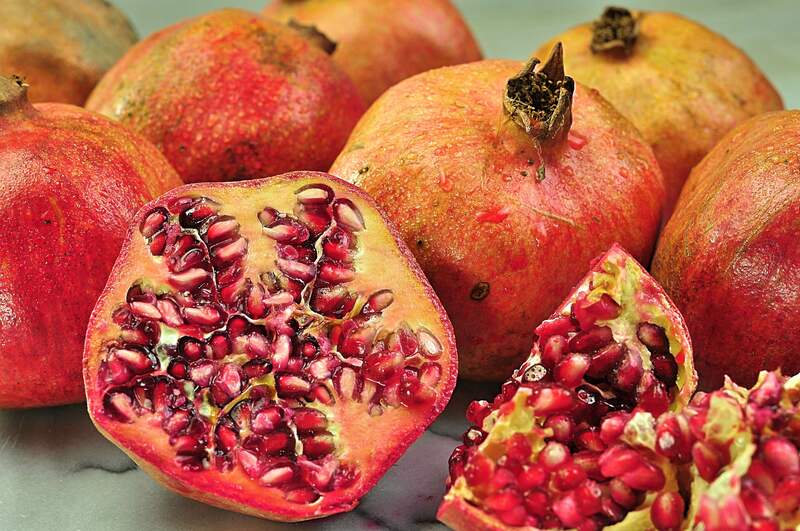 The Egyptians even believed that the juice of pomegranates were a kind of elixir that would bring immortality. Slightly ironic the hand grenade is named after the fertility fruit number 1 with just a slightly different thinking; the shape and the seeds that spreads everywhere if you drop it on a hard surface. You never know when you might need some extra knowledge to show off with … Just accidentally you then can mention something about the historical heritage of the blood-red seeds on your plate. You might just earn those extra points right there! The apple has a little bland, leathery skin fixed with a beautiful crown on top. The skin often has a reddish-brown color, but can also vary in shades towards pink. To find a ripe fruit, it works the best to look at the skin. It should be nice and hard and certainly not wrinkled! It should feel heavy in your hand. Under the skin you will find the fruit that actually consists of a bunch of tiny cores covered with a thin and juicy membrane around it. The cores shine with an almost ruby like color. Intense, bright red. The taste is fresh and tangy combined with a sweetness. You eat the cores fresh and if juiced they reward you with a fantastic taste just on their own! The seeds are fab to add to a salad, sprinkle on a morning yogurt or porridge or maybe as a beautiful and fresh decoration on a cake. The juice can for example be used to a make a tasty dressing replacing the vinegar in your vinaigrette. If you reduce (boil down) the juice, you will get a beautiful dark red syrup. You can also often find this ready-made in supermarkets with a Turkish or Moroccan origin. Just make sure to buy an unsweetened variety or it gets really sweet! How the heck do I get those red rubies in my bowl? Many foodies find it difficult to get the seeds without too much hassle and a complete covered kitchen but please. Do not let that stop you from these goodies! I like to use two different methods. Whatever method you choose, remember to always remove the white membranes in between before eating. They taste bitter! Put a large bowl in the sink (this will keep a distance from your white t-shirt and the red color that will never leave…). Cut the apple in two pieces with a sharp knife. Take one part of the apple and hold it over the bowl. Bash with the back of the knife on the skin side of the apple and the seeds will soon fall into the bowl. Repeat with the other part of the apple and your done! Cut a lid off from the top of the apple. You then easily can see that the fruit is naturally divided into wedges with a white membrane in between, just like an orange. Cut with a knife next to the membranes so that you get fined wedges. Voila! Now its easy to simply pick the seeds with your fingers. A whole pomegranate keeps well in the fridge for a few weeks or in the fruit bowl in room temperature for about a week. Don’t let it dry out, then the seeds will turn into a dull brown color and get a Woody woodpecker taste. An already cut apple can be kept in the fridge for a day or two without any perish but no longer. If you removed all the seeds at once, but don’t use them all right away, you can easily store them in a covered bowl in the refrigerator. Pour some of their own juice on top to make sure they retain moist. Would you ever get such a large number of pomegranates that you can’t finish them al at once, poke all the seeds and frees them in freezer bags. They last up to three months. Many studies show that pomegranate is healthy in so many ways, but I leave that to others to determine and tell about. I only know that with a fine pomegranate in the refrigerator Im ready to brighten up any dinner or breakfast, anytime! Fancy pomegranate? Here’s more recipes!